The works submitted here are by a collective of Latina women who have fled their countries of origin because of lack of state protection, interpersonal violence and conflict zones. We root our work within a feminist antiracist queer positive anti-oppressive approach. The women have sought refuge in Canada. However, Canada is not a safe haven of gender equality for women seeking asylum especially since changes to immigration legislation in 2012 that has seriously infringed on women’s access to safety and justice. The collective of women who participate in our Arpillera program must remain anonymous for reasons of personal safety. One of the works we have submitted to the conference was part of two separate exhibitions on human rights – one in Geneva Switzerland and the other Northern Ireland. The following is a common narrative of participants. This Arpillera was created by a Mexican Woman who sought help at our Clinic with her refugee claim. She explains: “I ran away from Mexico because I could not take the abuse anymore from my family or my children’s father. I asked for help from an agency in Mexico but they did not help me.” In Mexico, violence against women has dramatically increased, a situation which has been described as a “pandemic” by Ana Guezmez, representative to Mexico of United Nations Women, the UN entity for gender equality. Changes to Canadian immigration since 2012 have meant that anyone seeking asylum in Canada from countries designated as safe such as Mexico have less rights and face increased barriers to getting protection. Lynne Jenkins, Director of Counselling Services at the Barbra Schlifer Clinic, states that this has resulted in: “a sharp decline in asylum claims overall, including from Mexico.” This surely represents a compromising of Canada’s reputation as a safe haven of gender equality. 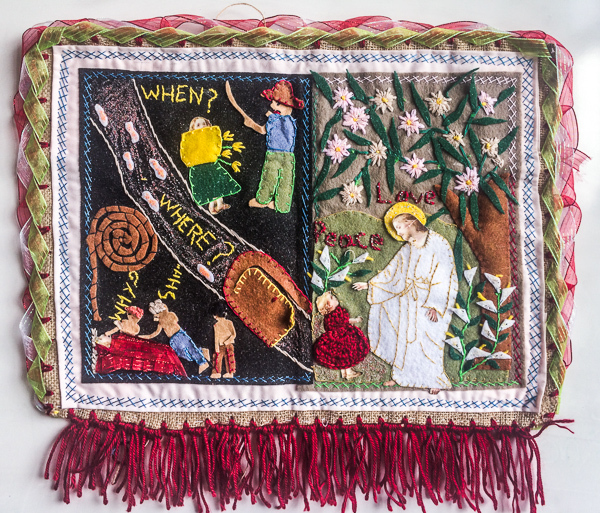 The Arpilleras we have submitted here are three dimensional appliqued textiles created by Latina Americana women. With bits of cloth and different stiches, the women create what they cannot put into words.